It was written in Lauh al-Mahfood (the Preserved Tablet) which is with Allah. From Lauh al-Mahfoodh, Allah revealed it to the lower heavens to Bayt al-‘Izza* (the House of Honor) in Ramadan, on Layla tul-Qadr. Finally, the Qur’aan came down to earth by Jibreel ‘alayhis salaam. This was done piece by piece, i.e it didn’t come all at once. It was revealed over 23 years: 13 years in Makkah, 10 years in Madinah. Wahy means to inspire or the communicate in a manner that is not obvious or apparent to anyone else in a swift manner. We will talk about wahy in one particular way, however, and that is the inspiration to the prophets. This has been the only way in which Allah has communicated with mankind: through inspiring one of our own, the Messengers. Wahy occurs in two ways: with an intermediary or without an intermediary. All of the Prophets’ dreams were inspiration from Allah. They were either shown something in the future or given a commandment from Allah in their dreams. The Prophet sallallahu ‘alayhi wa sallam had true dreams for 6 months before Prophet hood. These dreams prepared him for prophet hood. No Qur’aan was revealed in this manner (through dreams). Scholars say that dreams are 1/46th of Prophet hood. This is one of the ways that is mentioned in the ayah. For example, with Musa ‘alayhis salaam on Mount Tur. Also, when the Prophet went on the journal of al-Israa`, there was wahy with Jibreel as an intermediary. Revelation would sometimes come in a very severe manner, like the ringing of a bell. The Prophet sallallahu ‘alayhi wa sallam would break into a sweat. The angel would remain in his angelic form and the state of the Prophet would change so that he could communicate with the angel. This type of wahy was much more easy on the prophet because angel Jibreel would come in the form of a man and give the prophet sallallahu ‘alayhi wa sallam inspiration. The revelation to the other Prophets was not gradual like the Qur’aan was. They were given their books all at once. From Lauh al-Mahfoodh, Allah revealed it to the lower heavens to Bayt al-‘Izza (the House of Honor) during Ramadan on the night of Layla tul-Qadr. Finally, the Qur’aan was revealed down to earth by Jibreel. This was done piece by piece, as mentioned before. It was revealed over 23 years – 13 years in Makkah and 10 years in Madinah. It is unique to Islam and no other religion can boast this. The New Testament was authored over a century after ‘Eesa’s death and the Old Testaments authors are still shrouded in mystery, just like the authors of the Hindu scriptures. The writing materials for the Qur’aan include: scraps of cloth, stones, date-palm leaves, saddles and shoulder blades of animals. The Prophet sallallahu ‘alayhi wa sallam gave much importance to teaching the Qur’aan to new Muslims. He would assign companions to Muslims new to Madinah to teach them the Qur’aan. He would also send companions to other cities to teach the Muslims to recite Qur’aan. Twenty four people acted as scribes for the Prophet sallallahu ‘alayhi wa sallam. The four khulafaa`: Abu Bakr, ‘Umar, ‘Uthmaan and ‘Ali, are included in those and also Zaid ibn Thaabit, who we will talk about in much more detail later. There were seven companions who were foremost in recitation and from whom originate the ten qir’aat. They are: ‘Uthmaan ibn ‘Affaan, ‘Ali ibn Abi Talib, ‘Ubah ibn Ka’ab, ‘Abdullah ibn Mas’ood, Zayd ibn Thaabit, Aboo Musa al Ash’ari, and Abu Dardaa`. 1. There was no pressing need. There were many huffaadh. 2. The Qur’aan was continually revealed. The last revelation was 9 days before the death of the Prophet sallallahu ‘alayhi wa sallam. 3. The arrangement of the Qur’aan is not chronological (i.e. the way it is arranged is not the order in which it was revealed). When this many huffaadh died, ‘Umar suggested to Abu Bakr that he should compile the Qur’aan, because he was afraid it would be lost. Abu Bakr said, “How can I do that which the Prophet sallallahu ‘alayhi wa sallam did not do?” He was afraid that it would be considered an innovation in the religion. ‘Umar convinced him, telling him the merits of compiling the Qur’aan and proving to him that it wasn’t an innovation. 1. He was the primary scribe of the Prophet sallallahu ‘alayhi was sallam. 2. He had memorized the entire Qur’an during the lifetime of the Prophet sallallahu ‘alayhi was sallam. 4. He witnessed the last recitation of the Prophet sallallahu ‘alayhi was sallam to Jibreel. 5. He was one of the most knowledgable companions with regards to recitation. ‘Umar stood at the masjid and said, “Whoever has learnt any Qur’aan from the Prophet sallallahu ‘alayhi wa sallam, then let him bring it forth.” Zayd would sit at the masjid for people to come and tell him Qur’aan. He had very strict conditions for any Qur’aan to be accepted. 1. There had to be at least one written copy of the verse that was written in the presence of the Prophet sallallahu ‘alayhi was sallam. 2. There had to be at least 2 people (besides Zayd ibn Thaabit himself) that had learnt the verses directly from the Prophet sallallahu ‘alayhi was sallam. All of the verses met this strict criteria except for the last 2 ayahs of Surah at –Tawbah. And SubhaanAllah, when Abu Bakr heard who the single witness for them was, he said that it was fine to accept these verses. It was Abu Khuzymah, whose witness the Prophet sallallahu ‘alayhi wa sallam had said was equal to that of two. The mushaf was with Abu Bakr, then it was passed on to ‘Umar and then to Hafsa bint ‘Umar. This official copy was for not for the whole Ummah to follow but to ensure that it was preserved in its entirety. During the khilaafa of ‘Umar, the Muslim Empire expanded 5 fold what it had been. By the time ‘Uthmaan became khalifa, a problem was arising: since so many different people became Muslim, they all began reciting the Qur’aan in their own dialects. 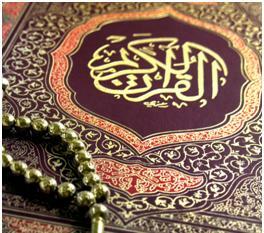 The Qur’aan was revealed in the Quraish’s dialect – the dialect of the highest eloquence. For this compilation of the Qur’aan, into one dialect, these four companions were chosen: Zayd ibn Thaabit, ‘Abdullah ibn AzZubayr, Sa’eed ibn Al ‘Aas, and ‘Abdullah al-Rahman ibn Al-Haarith. These companions were chose because of their knowledge of the Arabic language. So the Qur’aan was rewritten in the Quraishy dialect. ‘Uthmaan had one copy sent to every province and had the other copies in the provinces burned. This was a drastic step, but it had to be taken to preserve the unity of the Muslims. Not only did ‘Uthmaan send copies of the Qur’aan, but he also sent reciters to teach the people the correct recitation. With the advent of the printing press, the first print of the Qur’aan was actually done by a non Muslim in Germany in 1694. It had many mistakes, though. The first musahf to be done by Muslims in this style was in Russia, in 1787. Where are the Mushaafs Now? The mushaf of Abu Bakr was passed down to ‘Umar, then to Hafsa. It remained with Hafsa until she died, and the khalifaa Marwaan ibn al-Hakam had it destroyed. He said that he only destroyed it so as to preserve the mushaf of ‘Uthmaan. As for the ‘Uthmaanic mushafs, at least two of them still exist: one is in Tashkent (former USSR) and the other is in Turkey, on exhibit for everyone to see. One thing to learn from this is that the huffaadh used to be the foremost in good deeds during the Prophet’s time. This entry was posted in Companions, Islam and tagged 'Uthmaan, abu bakr, Compiling Qur'an, Islam, Preserving Qur'an, Qur'an, wahy, Zayd ibn Thaabi. Bookmark the permalink.